The Family Dining Room is used for less formal official dinners and lunches, such as the annual dinners for the Supreme Court and bishops. The Government is invited every year to a Christmas lunch here and the room is also used for the farewell dinner when a government steps down. The room can seat about 30 guests. 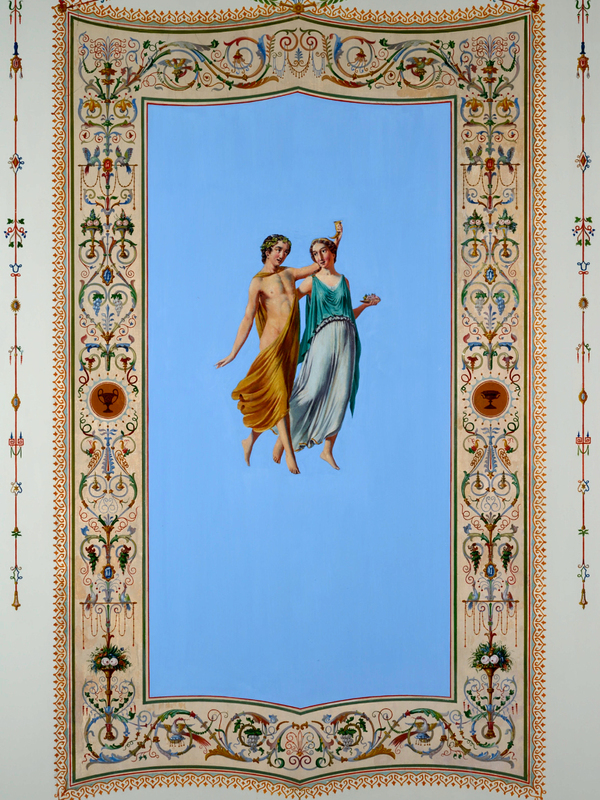 At the time when Linstow was planning the decoration of the Family Dining Room, frescos inspired by the finds at Pompeii and Herculaneum were the height of fashion in Europe. The Danish kings official dining room in Christiansborg Palace in Copenhagen (1833) and the Tsar familys private dining room in the Winter Palace (1837) were decorated in this style. 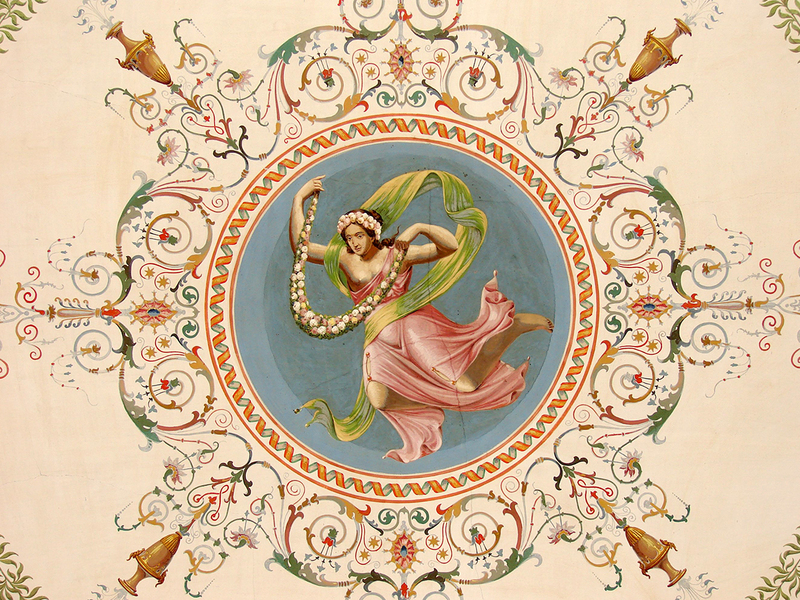 The walls and ceiling of the Family Dining Room were painted by Peder Wergmann in 1841. He and his helpers spent seven months decorating the room, including three months devoted to the ceiling. The men and women depicted in the blue panels were painted by August Thomsen. 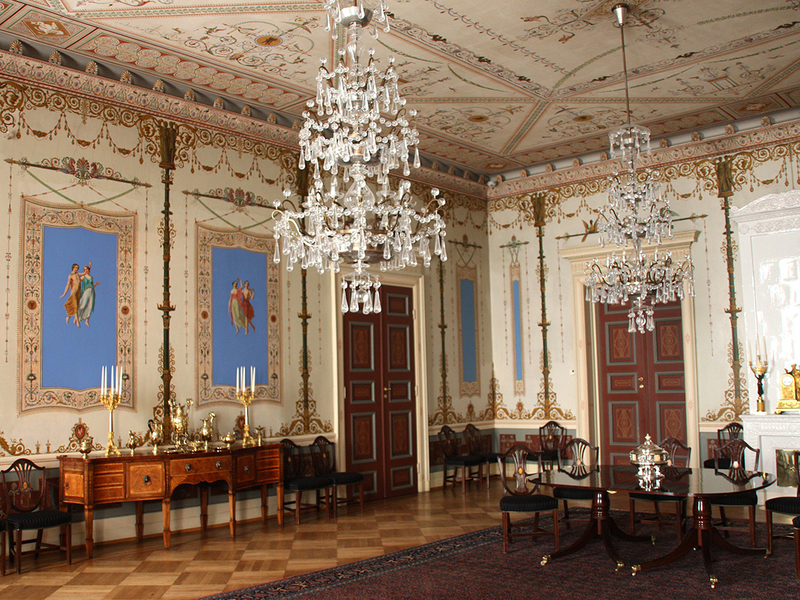 The furniture and chandeliers in the Family Dining Room were given to King Olav V by Norwegian friends and organisations in 1963 in honour of his 60th birthday. The chairs are copied from an original Hepplewhite chair that is part of the set, and were made in Oslo by master cabinetmaker Lørup. He also made the table, in a style that was fashionable in England in about 1780-90. The chandeliers were designed by Jonas Hidle and produced by Hadeland Glassverk. Hidles design reflects the simple ornamentation of the walls, and the garlands of crystal droplets follow the lines of the painted garlands in the border beneath the ceiling. The Palace's collection of the Flora Danica dinner porcelain by Royal Copenhagen is displayed in the Familiy Dining Room. The name comes from Flora Danica, a botanical atlas that was begun in 1761. By its completion in 1883 it contained 3,240 hand-painted copperplate illustrations of all the known wild plants native to Scandinavia and Northern Germany. The first pieces of the service were made towards the end of the 1780s, but all the 1,802 pieces were not completed until 1803. King Christian VII of Denmark is said to have intended it as a gift to the Empress Catherine of Russia, but she died before the service had been completed. Two of the dinner plates displayed in a cabinet in the Family Dining Room are from the original service. The service has been supplemented over the years by inheritance and gifts to the Royal Family. The Empire silver-gilt table service on the sideboard is known as the Brazilian silver. It originally belonged to Pedro I, the first emperor of Brazil. Pedro I was married to Amalie of Leuchtenberg, the sister of Queen Josephine of Sweden. The service was part of an inheritance to the Swedish Royal Family. The service was made by the well-known French goldsmith Odiot, and consists of 13 pieces. The Royal Palace in Stockholm has a larger collection of the same service. The colours and designs on the doors leading to the Mirror Hall and the Small Ceremonial Hall were reconstructed in 1962. Part of the ceiling and walls of the Family Dining Room were cleaned and restored in the late 1990s.